"Were Gray Foy's extraordinary delicacy unaccompanied by poetic sensitivity to ﬂowers and growing things, these drawings might be no more than astonishing tours de force. Such is not the case. They both amaze and please." 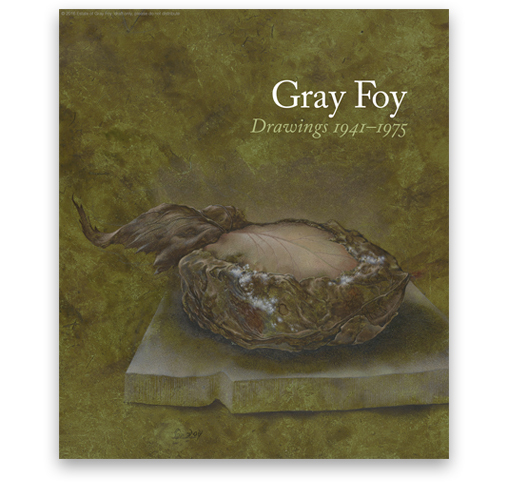 This elegant and distinguished book showcases the unique and mesmerizing art of mid-century American artist, Gray Foy. Long eclipsed from public and private view, this large cache of drawings was discovered after Foy's death, mostly hidden in drawers and closets. The ﬁve-year effort to prepare the astonishing discovery for publication culminates in this stunning volume of drawings whose rare beauty will appeal to cognoscenti and general readers alike. Born in 1922 in Dallas, Foy spent his youth in Los Angeles and went on to study art at Southern Methodist University in Texas and Columbia University in New York. His drawings appeared in numerous group exhibitions (including several Whitney Annuals), and he received a Guggenheim Fellowship. Foy’s drawings are executed with a draftsmanship whose meticulously detailed qualities challenge the viewer’s visual acuity. His early work, related to both Magic Realism and Surrealism, conveys afﬁnities with artists as varied as Salvador Dalí and M.C. Escher, and is characterized by complexly interwoven compositions in which human ﬁgures, ﬂora and fauna, and terrains and interiors morph into vivid dreamscapes. His mature drawings focus on botanical and geological forms in the process of transformation, metaphorically suggestive of the passage of time and the mutability of perception. There has been renewed interest in Gray Foy's art as a result of a 2004 article in the New York Times by Steve Martin about the artist and his 1942 masterpiece, Dimensions, which Martin acquired and donated to the Museum of Modern Art. Now for the ﬁrst time, Gray Foy's work has been collected in Gray Foy: Drawings 1941-1975, which includes sixty-one full-color plates, an exhaustive chronology, and a selection of Foy’s commercial illustrations for book jackets, magazines, and record album covers. DON QUAINTANCE is an independent graphic designer based in Houston and an occasional author and editor. He has designed more than two hundred art-related exhibition catalogs and monographs, including retrospectives for Barnett Newman and Arshile Gorky (Philadelphia Museum of Art), Robert Rauschenberg, James Rosenquist, and Alberto Burri (Solomon R. Guggenheim Museum), and Max Ernst (Metropolitan Museum of Art). LYNN M. HERBERT is an art historian and the former Senior Curator at the Contemporary Arts Museum Houston. She is noted for exploring the spiritual dimension of art through the PBS television series and its related publication Art21: Art in the Twenty-First Century (2001). She was the founding director of the Houston Center for Photography. ALEXIS ROCKMAN is a contemporary artist who has become well known for monumental paintings that represent fantasias on environmental destruction and genetically modiﬁed organisms. His work has been the subject of over ﬁfty solo exhibitions in galleries and museums worldwide, including “Manifest Destiny” (Brooklyn Museum of Art) and “Alexis Rockman: A Fable for Tomorrow” (Smithsonian American Art Museum). A compendium of his work, Alexis Rockman, was published in 2005 (Monacelli Press). STEVE MARTIN is a writer, musician, and performer. His books include a collection of comic pieces, a novella, a novel, a memoir, and several children’s books. Martin’s writings on art include essays on Eric Fischl and Jackson Pollock’s Mural. He recently curated the exhibition “The Idea of North: The Paintings of Lawren Harris.” Martin was a friend of Gray Foy’s beginning in 1981. GRAY FOY (1922-2012) was known as a great artist and avatar of New York City's literary gilded age. Born in in Dallas, he moved to Los Angeles with his mother at age four. In his youth he moved to New York where he studied art at Columbia, ﬁnding success with his unique art while still a student. He became an artist of substantial early reputation, embodying great artistic promise and drawing phantasmagorical scenes like no other artist. With his husband Leo Lerman, his companion for more than half a century, Gray Foy became a ﬁxture of New York City's gracious, aesthetically-attuned literary and art scene of which Truman Capote was perhaps its most visible embodiment. They cultivated reﬁned friendships with the city's foremost cultural luminaries such Frederick Ashton, George Balanchine, Leonard Bernstein, Paul Bowles, Maria Callas, Mr. Capote, Carol Channing, Betty Comden and Adolph Green, Aaron Copland, Marcel Duchamp, Margot Fonteyn, John Gielgud, Martha Graham, Cary Grant, Anaïs Nin, Jacqueline Kennedy Onassis, Edith Sitwell, Susan Sontag, and many others. But his engagement in this unique and rareﬁed social whirl largely eclipsed his art, which this volume brings to the fore once more showcasing an extraordinary assembly of Foy's drawings that had remained unseen for many decades until now.